250 students participated in the Bridge21 TY graduation ceremony on Wednesday 18th May in the Old Dining Hall in Trinity College. Along with teachers, parents and representatives from TCD, they came together to recognise and celebrate their great work and achievements at Bridge21 throughout the past year. Dr Rónán Smith from the School of Computer Science and Statistics spoke to the students about the skills they have developed in transition year and with Bridge21 and how they will be relevant as they move through education and pursue a career. 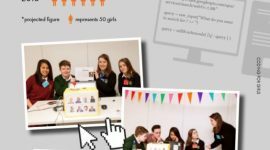 He encouraged them to stay active, to maintain hobbies, join clubs and keep the best things from transition year going as they take on the Leaving Certificate and move into third level. 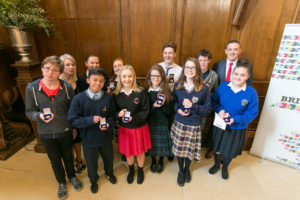 Each student received a certificate to recognise their work during the year and a small number of students received medals for outstanding acheivement. The “Spirit of Bridge21” winners were Jasmine Curry from Presentation Warrenmount and Niall O’Toole from Drimnagh Castle CBS. The Leadership award went to Hannah O’Neill from Donabate Community College. The “Computer Science Team of the Year” award went to The Knights of the Square Table. 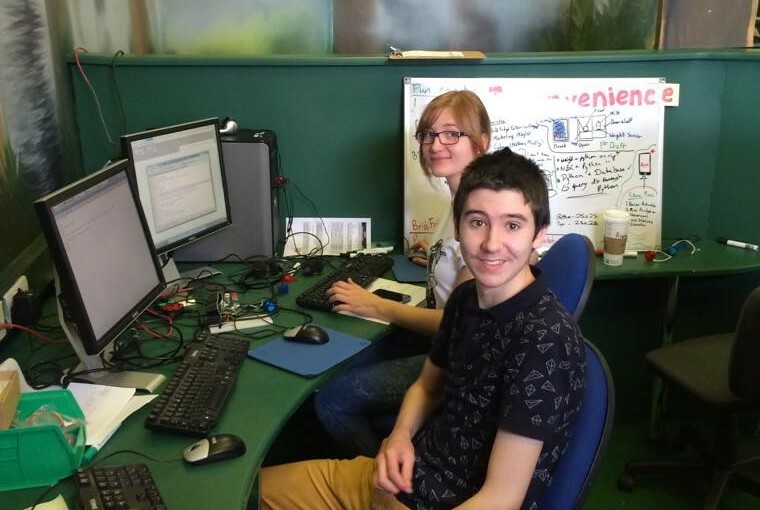 The CS-TY programme, which is run with the School of Computer Science and Statistics here in TCD, was expanded this year to include 125 students from schools all around Ireland. We were particularly delighted to have female students take up 60% of the places on the programme. 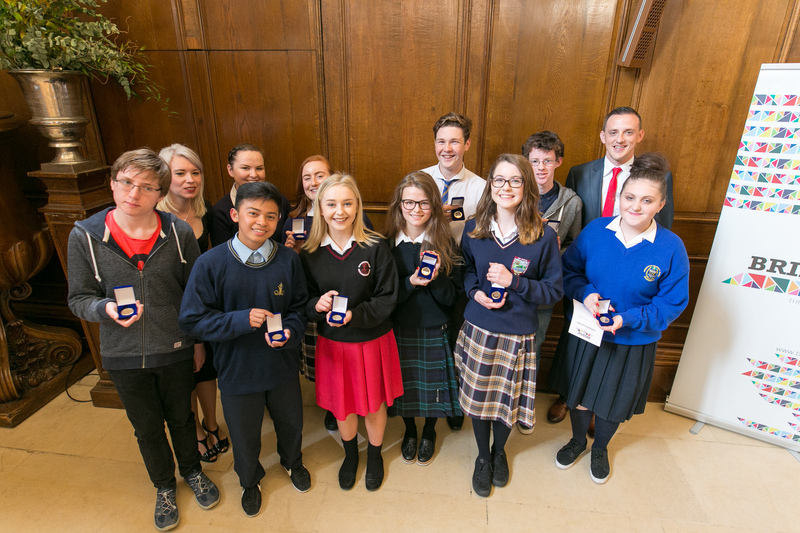 Catherine O’Connor from SCSS presented them with their medals. 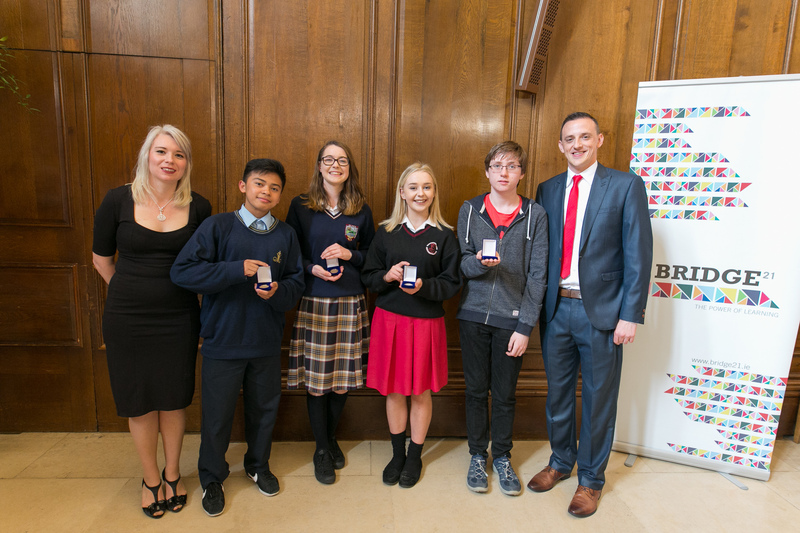 The Knights of the Square Table are Anna O’Reilly from Donabate Community College, Addam Reyes from Moyle Park College, Luke Derwin from Mount Temple Comprehensive and Chloe Cullen from Gaelcholaiste na Mara, Arklow. Finally, Divide by Zero won the overall “Team of the Year” award. 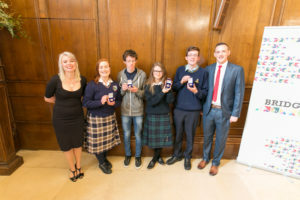 Divide by Zero included Adriana Lapsin from Colaiste Bride, Rory Kilby from Mount Temple Comprehensive, Aaron Douglas from Moyle Park College and Sadhbh Nevins from Donabate Community College. It won’t be the last we’ll see of these students though. 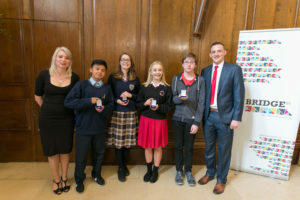 Many of them will be taking part in Bridge21 programmes over the summer including Primary School Mentoring, Computer Science, English and Art. Here are some of the highlights from the day…. This entry was posted on Tuesday, May 24th, 2016 at 10:26 pm. It is filed under Events. You can follow any responses to this entry through the RSS 2.0 feed.